The ASTM International Committee D02.96 on Petroleum Products, Liquid Fuels, and Lubricants recently presented their Award of Excellence to Spectro Scientific's Chief Technology Officer, Dr. Patrick Henning. 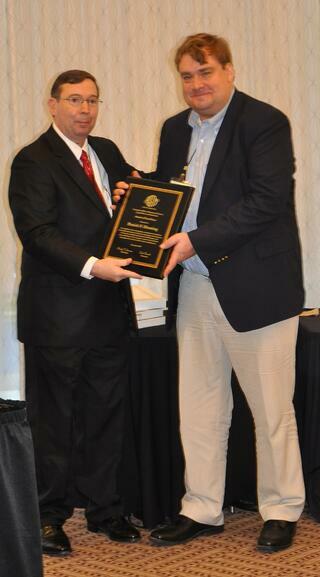 "Dr. Henning served as sub-committee vice chair and section co-chair for several years. During his tenure and by his hand, several innovative new standards representing cutting edge technology were developed," said Randy Jennings, Chairman. "Dr. Henning is always gracious, accommodating of others' views and sure to insist upon the highest quality possible. For these efforts, CS96 would like to recognize a continued level of excellence." Dr. Patrick Henning is Chief Technology Officer at Spectro Scientific, where he leads new technology initiatives. He was Co Vice-Chairman of ASTM Committee D02.96 on In-Service Lubricant Testing and Condition Monitoring Services from 2010-2015, and currently serves as co-chair of D02.96.03 and D02.96.07 subcommittees on FTIR and integrated testers for in-service lubricants. Previously, Henning worked in QinetiQ North America’s Technology Solutions Group for 10 years, ultimately serving as Technology Area Manager of Spectrum Solutions, where his work focused on the development of new sensing technologies for oil/fuel analysis as well as chemical/biological detection. As a postgraduate researcher with joint appointments at the University of California, San Diego and Brookhaven National Laboratory, he specialized in developing new hardware and data analysis tools for infrared and terahertz spectroscopy. Henning earned his PhD in physics from Florida State University’s National High Magnetic Field Laboratory. He is the author of numerous technical publications that have appeared in leading international scientific journals.